A timber brightener that cleans and brightens weathered and grey timber and assists in opening the timber grain to allow penetration of the coating. Used neat it will kill mould spores. Oil based paint or stains - 2 to 3 days, Water based paints or stains - as soon as timber is dry. Clean the whole area at the same time. DEX PREP may not remove old deep seated fungal stains and timber marking dyes. For best results apply DEX PREP to cool surfaces out of direct sunlight. Do not allow to dry on the surface before removal. Failure to remove the cleaning solution residue may result in timber discolouration under clear finishes or early failure of the coating due to changed pH. 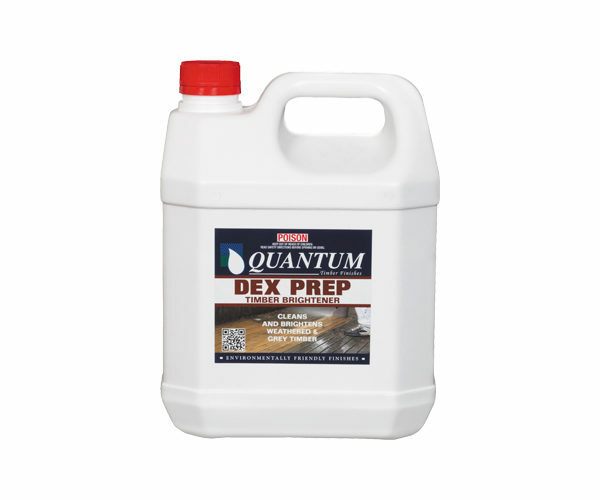 DEX PREP is mildly acidic, avoid contact with painted metal surfaces and vegetation. Rinse thoroughly if contact occurs. Remove surface dirt by sweeping or hosing. Wet the surface to be cleaned. Apply mixture generously with a scouring or scrubbing brush and scrub timber thoroughly. Leave for 10-15 minutes. Rinse off using a garden hose, or high pressure water cleaner for large area or badly discoloured timber. Grey or dirty timber over 12 months old.